Spot prawns are Mike’s absolute favourite seafood so now that it’s spot prawn season we’re going to be eating prawns like crazy. 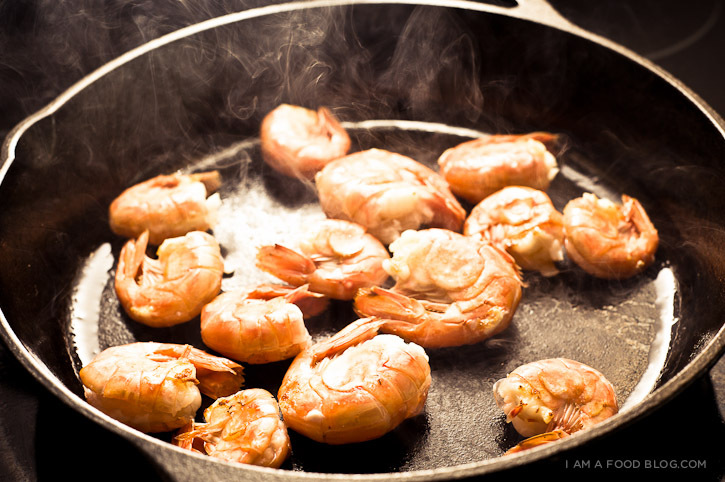 We love grilled prawns, but no patio means no grilling so I usually just pan-fry the prawns before tossing them in whichever dressing is tickling our fancy. 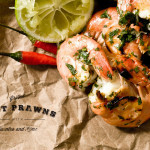 Spot prawns are delicious – sweet, tender and extremely meaty, in a good way. 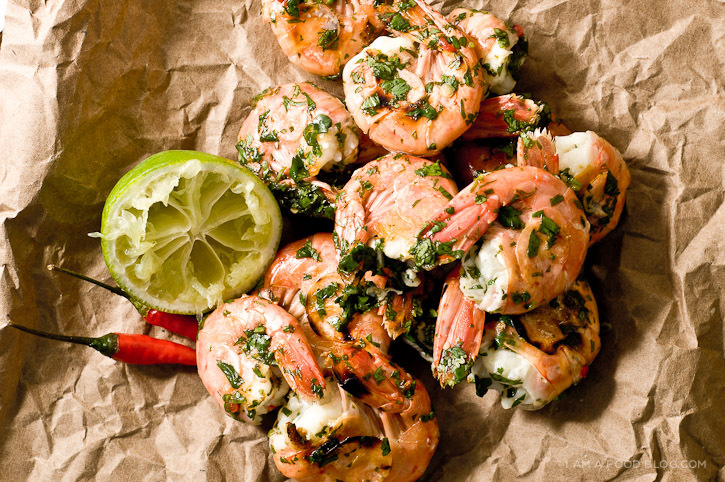 They taste fantastic with salt, pepper and a squeeze of lemon, but lately we’ve been enjoying our prawns tossed in a Vietnamese-esque dressing of lime, fish sauce, sugar, chilis and cilantro. 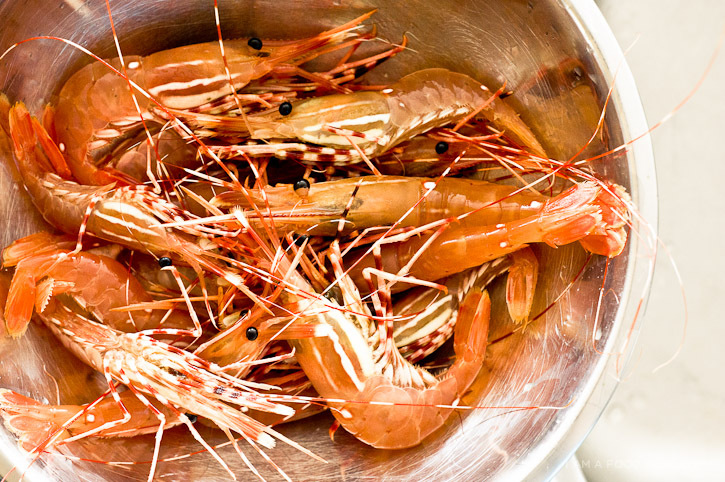 Spot prawn season is really big here – all the restaurants start featuring spot prawns and there’s even a festival. You can pretty much buy them anywhere when they’re in season. We bought our first batch of spot prawns at Whole Foods. They weren’t live – they actually had their heads taken off, but they were still tasty. Even though the Whole Foods prawns were delicious, with seafood fresh is always best, so Mike and I decided to go down to the docks for our next batch. They sell them to you fresh off the boat; they’re literally still alive and jumping. The prawners that I bought from were a bit strange – maybe they smoked a little too much “seaweed”? Anyway, one of them threw a small prawn into the ocean where it just floated for a while. Me: Oh no, he’s dead! Prawn Man: Don’t worry, he’ll make his way back out there. Me: Uh, he’s not swimming. Prawn Man: Holy mackerel! Did you see that?! All of a sudden a bunch of fish attacked the poor prawn. It was pretty crazy. All the prawn men crowded around to watch the poor prawn get eaten. I know it’s crazy, but I felt a little sorry for the prawn. Double standard, I know. I have this dilemma with eating fresh seafood. I love it, but I’m not able to…how do I say this nicely…kill it. I tried to chop the head off one of the prawns that was nice and still, but as soon as I got close, it’s antenna started moving like crazy! I couldn’t do it. I just couldn’t take the knife to the prawn. A quick google search told me that putting the prawns in the freezer for twenty or so minutes would put them to sleep so they wouldn’t feel any pain. I’m not too sure if I believe that, but non-moving prawns are a lot easier to deal with than twitchy ones. Live prawns are a bit more work than the prawns from Whole Foods. But, there is a definite taste difference: live prawns are sweeter, plumper and juicier. I guess you just have to get your hands a little dirty if you’re going to eat the good stuff. 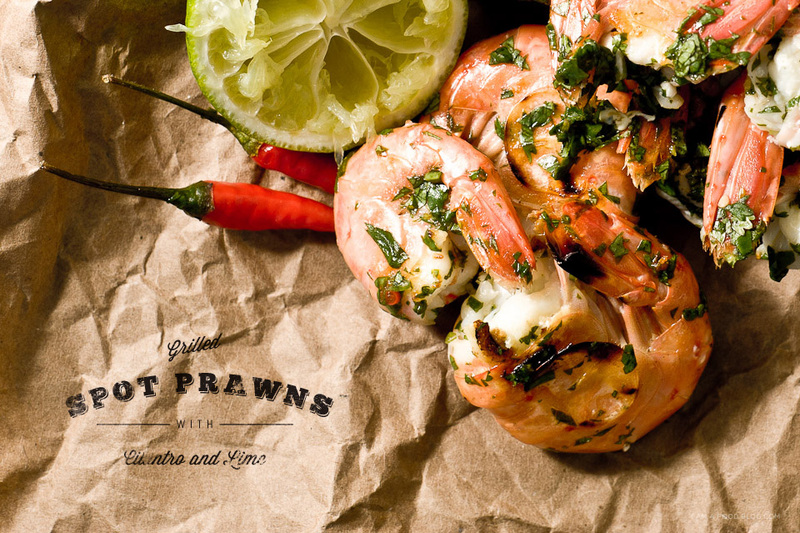 i am tangy, i am sweet: i am spot prawn with lime and cilantro! Prepare your prawns: use a pair of kitchen shears to cut through the back of the shell. Cutting through the shell lets you de-vein the prawn easily. In a large bowl, mix together the lime juice, fish sauce and sugar until the sugar is dissolved. Add the zest, chill and cilantro. Taste and season with salt and freshly ground pepper. Heat up a cast iron over medium-high heat. Add a bit of olive oil to the pan. When hot, add the prawns and cook without moving for 2 minutes. Flip and continue to cook for 1-2 minutes, until pink and firm. Toss the shrimp in the dressing. Enjoy hot. I know what you mean about feeling sorry! I sometimes have a problem when cooking mussels (though, I do get over it). I worked at a restaurant once where we had baked stuffed lobster on the menu. They literally began the process by cutting the lobster right down the middle, I could never do that! I don’t feel bad about dispatching something for my dinner. We live on a planet where living things have to eat other living things in order to survive. Hack them things up guilt free! With what little brains they have they’re the equivalent of cockroaches. And in this post, they look like splendid tasting ones too. Megan Q. Don’t worry about the mussels. They don’t have brains at all. They basically live as muscles that twitch in response to their environment. And they sure taste good. 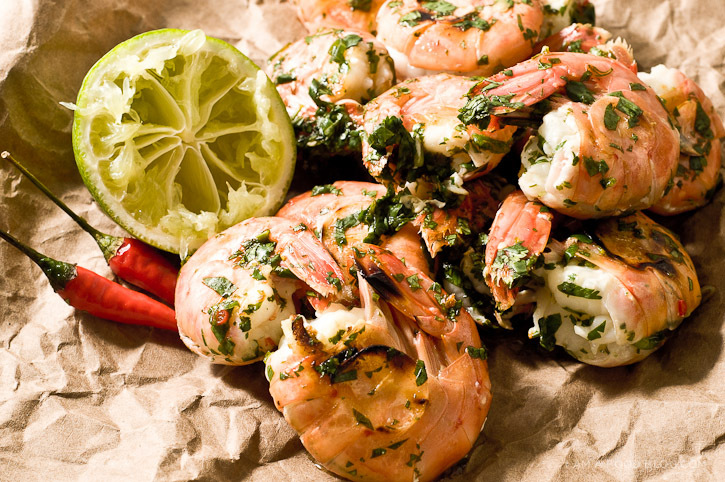 Those look amazing and the prawns are so beautiful! I agree with Darren up here, quit with the guilt and start with the eating! Your photos are just so beautiful! And now I’m super hungry for this prawn-y goodness. This blog is overwhelmingly gorgeous! What camera & lens do you shoot with? Your photos tell a great story! You are my favourite new blog! Thanks for the story and the p;ics. Yummers! Looks so good, I will try for sure. Keep blogging. I love your postings. So simple and so good! The GF loved it too and she’s not usually a seafood lover, much less fish sauce. Fantastic flavor combo. 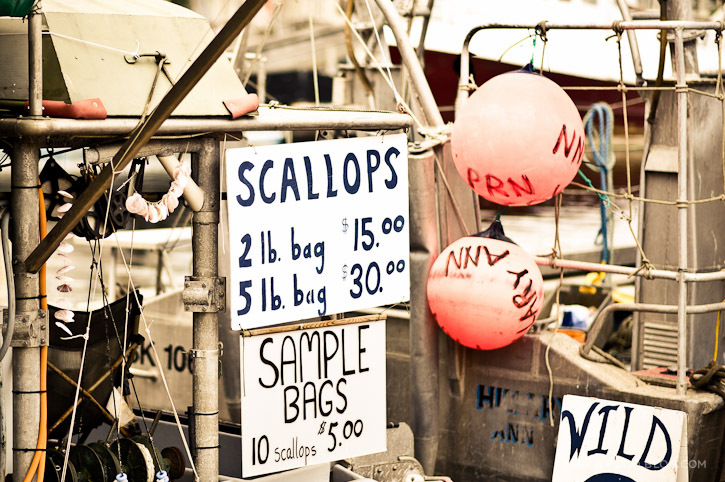 I just want to know where I can get scallops for $7.50 per pound!! I’d have to average in gas…but then I could also pick up other “coastal” supplies I can only get when I’m visiting the coast. I’m like your mom…my freezer is FULL!! Truly, your shrimps look marvelous, and I wish I had some! They’re supposed to be much tastier when cooked in shell…so I imagine freshly caught…freshly cooked makes them that much better! Love the new blog!! The old one too! This was delicious. My son’s favorite food is shrimp or prawns. He wants shrimp on everything. He gave this recipe two thumbs up. Im making this tonight for dinner! 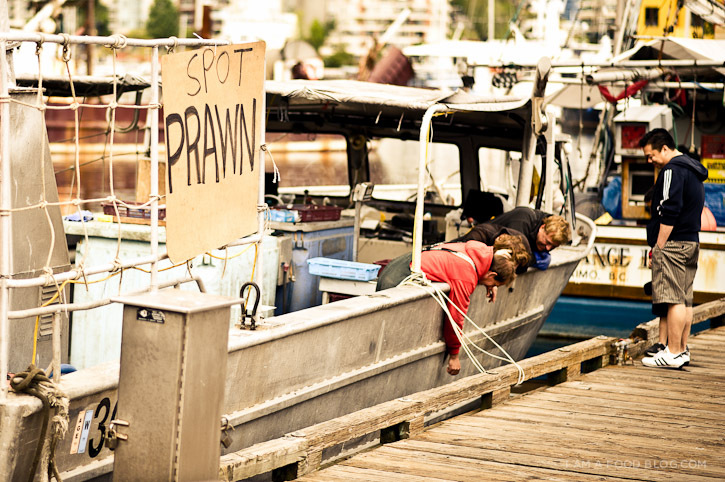 I live on Lummi Island and local spot prawns are abundant, sweet and simply amazing. The only change im making, will be to saute in clarified butter with a squirt of Sri Racha. Your Blog is amazing, Im a new and devout fan. Tried this for the first time last week and it was absolutely fantastic. The dressing is so zingy, yet so simple to remember(basically 2+2+2+2 and a handful of cilantro/coriander). I’m now wondering if this would work with any other protein. These look great! I wish there was somewhere local that I could get good fresh seafood.